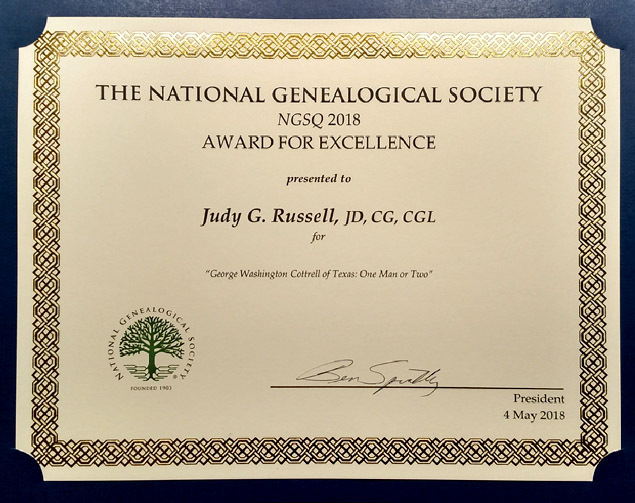 There is no doubt as to who wins The Legal Genealogist‘s “all-time favorite ancestor” award. It’s my rascal second great grandfather George Washington Cottrell. A scoundrel who had some fairly significant disagreements with the law — let’s see here… indicted for bigamy, adultery, gaming, assault and battery and… oh yeah… murder — and some fairly significant problems with telling the truth, George has been a delight to chase through the records. And now I have one more reason to keep George at the top of the leader board. Now do you think you might give me a hint as to who your parents were????? Way to go, Judy!!! Congratulations! Congratulations, Judy! No surprise to us, your followers, who’ve known all along that you are the BEST! Good luck with George! Congratulations! A well deserved honor. Congratulations! A well-deserved award for articles well written and always interesting. and not least,’your communicating new developments in this field on a daily basis are all major contributions. Many thanks! George would be so proud of his great great niece. Always entering new frontiers of discovery! Wow, congratulations! So well deserved. You are an amazing asset to the genealogy community, pros and amateur alike.